I’ve been working on these gems for a few months now. Each time I’d get close to posting them for you, I’d think of another way to improve them – to make them more wholesome, more packed with antioxidants, more giving of delicious energy sources. So what exactly are these? Well, I couldn’t decide definitively what these should be called. 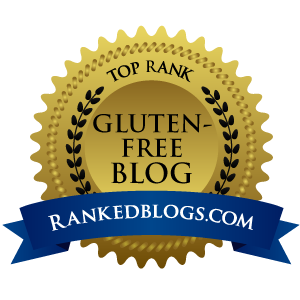 They fit perfectly into the gluten-free, dairy-free protein bar, healthy snacks, whole nutrition bars, energy bars, power bars, and such categories. 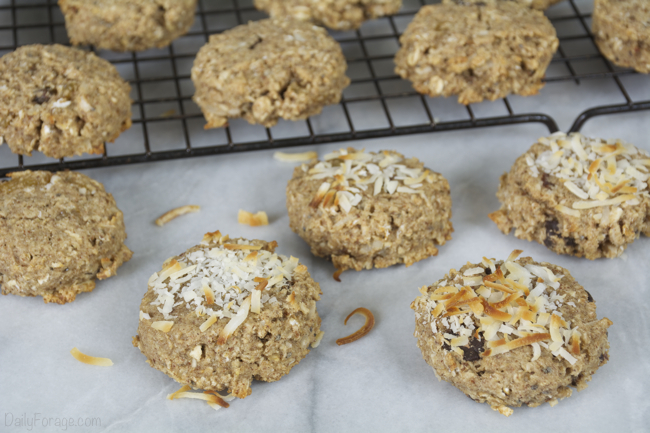 They also are perfect when referenced as a whole food breakfast recipe, and in the healthy cookie genre. Point being, these Power Pucks, as I’ve nicknamed them, will keep you going strong, focused, and satisfied for hours on end any time of day. Containing over 20 ingredients (now don’t get overwhelmed – stick with me) including cinnamon, vanilla, dark chocolate chips, and coconut, as well as nut butter, oats, date puree, raisins, chia seeds, and flax meal, there’s plenty of deliciousness happening right amongst the nutritional benefits. 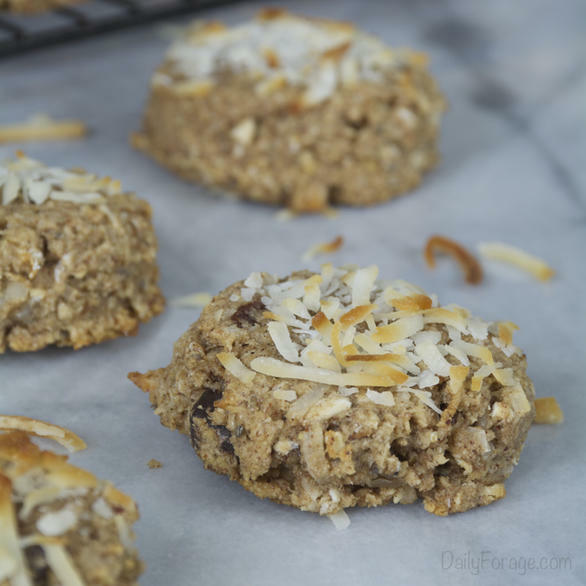 Ultimately, these really are just perfectly textured, not too sweet, chewy oatmeal cookies wrapped up in a gluten-free, dairy-free, egg-free, soy-free recipe. Two more things … these cookies are delicious at room temp, but I especially enjoy them when they’ve just come out of the freezer five minutes earlier. Also, this recipe makes about 56 cookies, so freezing some or making a half batch might be a good idea if there aren’t a lot of people to consume them (they’re very filling). Servings: Makes about 56 cookies. Combine 1 teaspoon baking powder and applesauce in small bowl. Set aside. 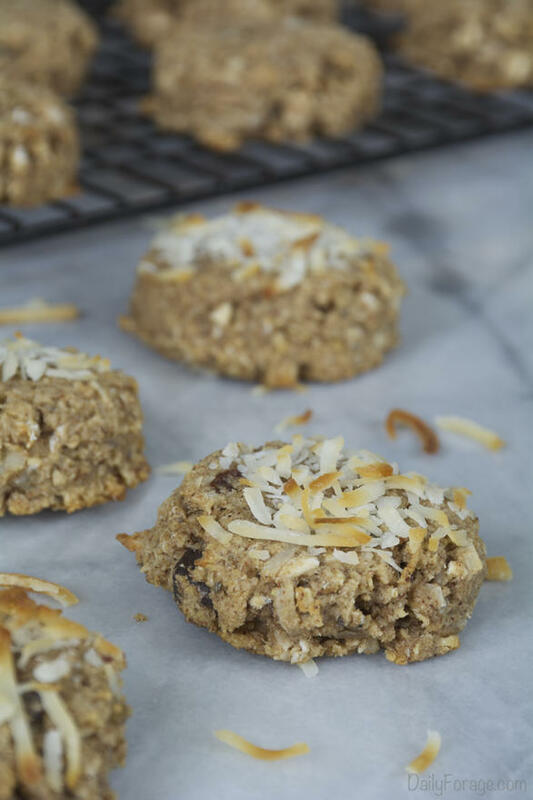 Combine sorghum and almond flours, guar gum, baking soda, 1/4 teaspoon baking powder, salt, cinnamon, coconut, chia seeds, raisins, chocolate chips, and flax meal in a bowl. Stir well to combine. In the bowl of a stand mixer, or in a regular mixing bowl, beat together nut butter, coconut oil, honey, and brown sugar until well combined. Add applesauce mixture, mashed banana, water, vanilla, and date puree. Mix well. With mixer on low speed, gradually add in the dry flour mixture to the wet mixture. Continue mixing until all flour mixture has been incorporated. With mixer still on low, stir in oats and mix until fully incorporated. Line a baking sheet with parchment paper. Using a level 1 3/4 inch (#40) scoop, or a rounded ball approximately 1 1/2 inches in diameter, make balls of dough and place on lined baking sheet, 12 per pan. Lightly oil the back of a spatula and gently press the balls slightly to flatten the rounded tops. Garnish (if desired) each cookie disc with a few pieces of shredded coconut and press gently to stick to cookie. Bake in a preheated 375ºF oven for about 12 minutes per sheet, or until cookies are tender but firm. Garnish will be nicely toasted. Remove from oven. Transfer cookies, still on parchment, to a cooling rack. Let sit for two minutes then transfer cookies off of parchment and continue cooling on rack. Store cookies in airtight container at room temperature when completely cooled. Store in freezer for longer storage. Thaw at room temp. To make date puree: Combine 1 cup chopped, pitted dates (I like Medjool), 1/2 cup water, and 1 1/2 teaspoons fresh lemon juice in small sauce pot. Simmer over low heat, stirring and smashing dates occasionally, until water has cooked away and dates are soft and mixture has become a puree. Leaving some date pieces soft and chunky is fine. Remove from heat and set aside for recipe. These are delicious! Have you determined the nutritional value of one of these jewels? Also, have you tried to freeze the dough? Hi Cheryl! Thanks so much – I’m very glad you love them! I haven’t determined the nutritional value. That is a feat I’ve not tackled with my recipes. Perhaps someday. To answer your question about freezing the dough, I have done so and then let the dough come back to “fridge” temperature by allowing the dough to rest refrigerated for about 24 hours before baking. I have also frozen the baked and cooled cookies. They store very well in the freezer, and are then ready to be enjoyed on quick notice. They can even be popped in the microwave for 8-10 seconds to be enjoyed as a warm, nutritious snack or midday boost. I hope these tips work for you. Happy, healthy baking!